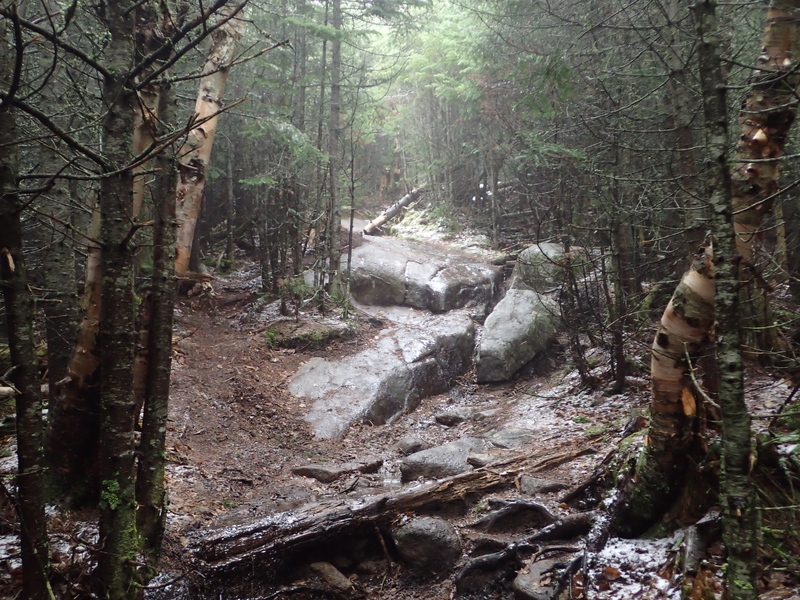 The weather wasn’t looking great for a hike so we opted to do a shorter High Peak than we had originally planned. 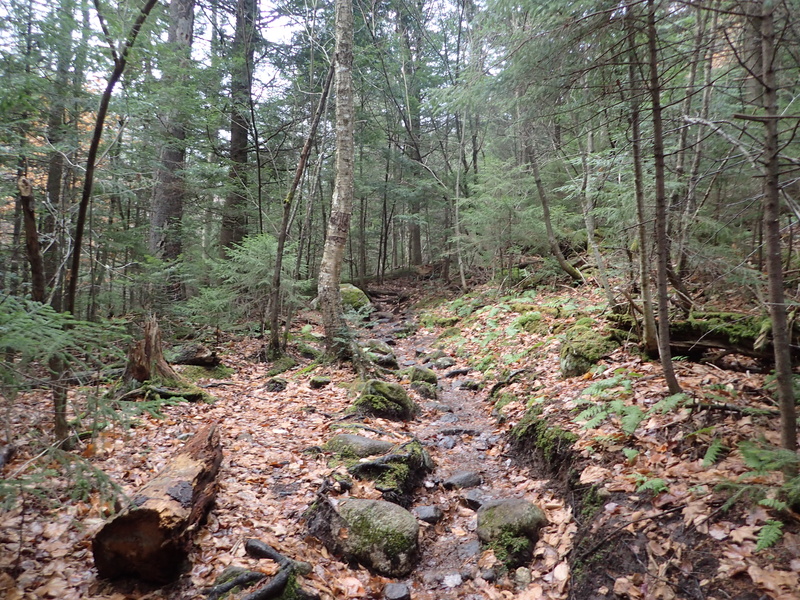 We settled on hiking Giant Mountain from the Roaring Brook trailhead on Route 73. I have hiked Giant twice before in winter and summer, but this would be my first autumn ascent and Kelly also needed it for her 46. 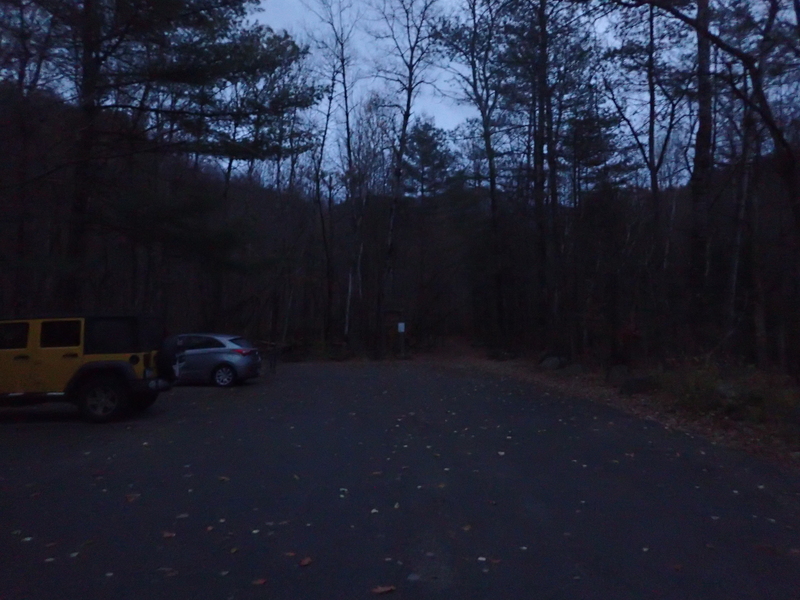 We got to the small parking lot before the sun came up so parking was a non issue. Although based on the thin crowds we saw when we got back to the car it seems like the crowds have died down quite a bit. View of the parking lot when we started the day. After packing our things (including our micro spikes! Winter Hiking Guide) we hit the trail. 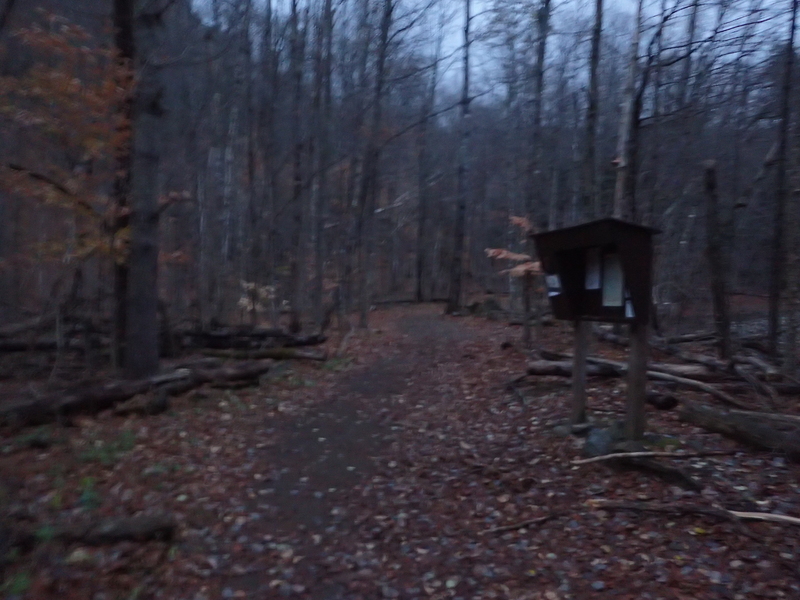 Right as you start down the trail from the parking lot you will see the trail register. We signed in and kept moving down the trail. Trail register as you start down the trail. After passing the trail register a minute down the trail you reach the first junction on the hike. From here turning left will take you up towards Giant and going right will take you to the base of Roaring Brook Falls. We hung a left and started up the trail. From the junction the trail begins its steady climb upwards. The hike to the Summit of Giant may not be particularly long in terms of mileage but it makes up for it with elevation gain. Right from the start the trail carves a steep path seemingly straight up the side of the mountain. This can make for a slow climb if you are a bit out of shape on steep terrain so you should consider this in your own timetable. View of the trail leaving the first junction. The trail wound its way up and over small hills as we worked our way up towards the Giant’s Washbowl and the Summit of Giant beyond that. We made quick and steady progress and before too long we reached the next junction on the trail. From here it was 3.1 miles up to the summit. We hung a left and continued on our way. View of the second trail junction. 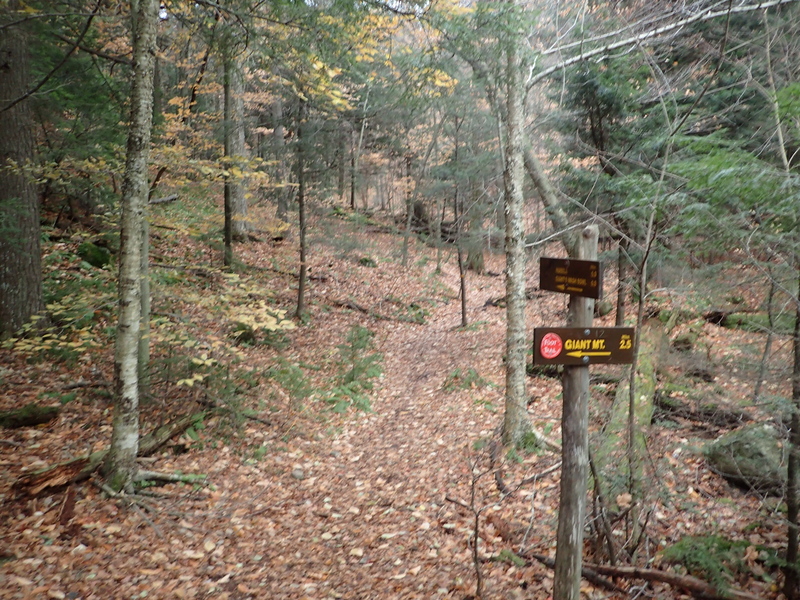 This second junction also marks the top of Roaring Brook falls. From this point the trail got much more eroded and root covered, but it is still well marked and easy to follow. 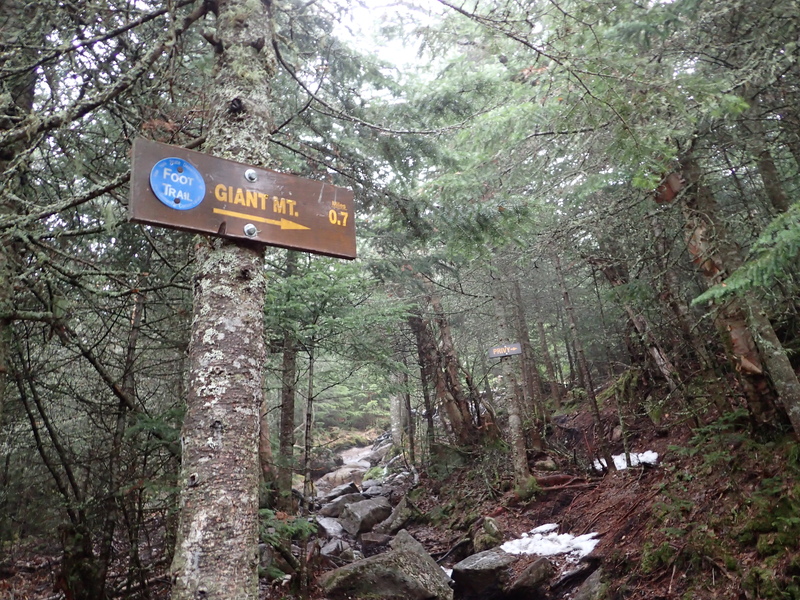 The trail up Giant sees a lot of traffic during the warmer months so it is easy enough to follow the well worn trail. There was a large amount of freshly fallen leaves but that didn’t really make much of a difference in terms of navigation. View of the trail following the second junction. 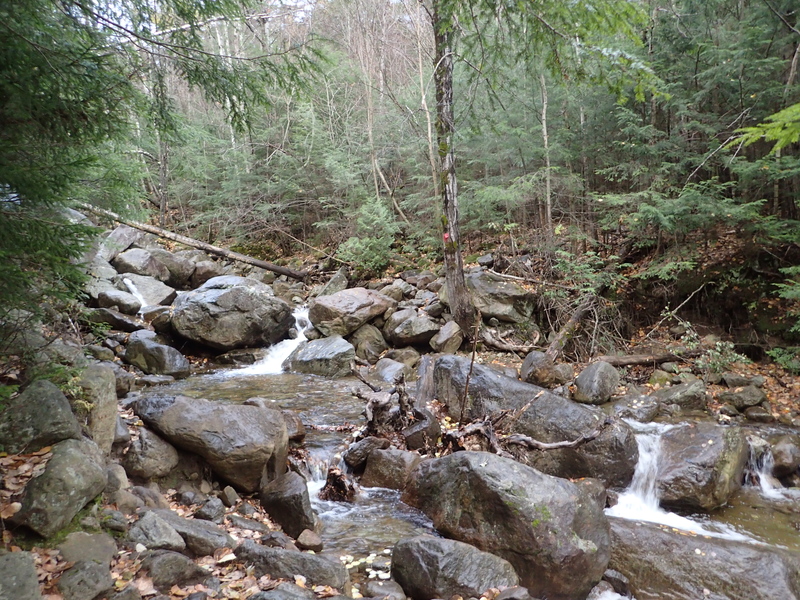 Before too long we reached the only major brook crossing over Roaring Brook. On account of the recent rain and snow melt it was flowing pretty strong but luckily there were still enough exposed rocks to hop across. By the end of the day the water level actually went down quite a bit. 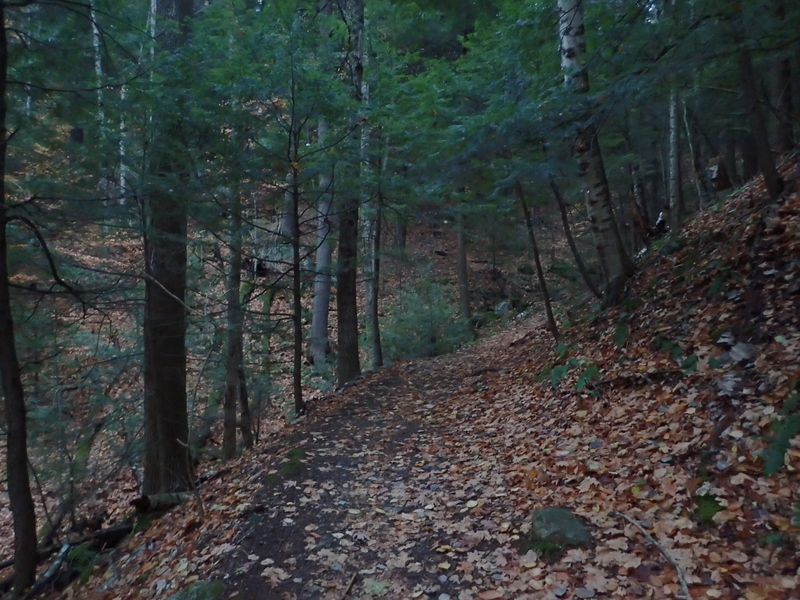 Trail crossing over Roaring Brook. After crossing the brook the trail got increasingly rockier before taking us to the third trail junction. Trail following the brook crossing. 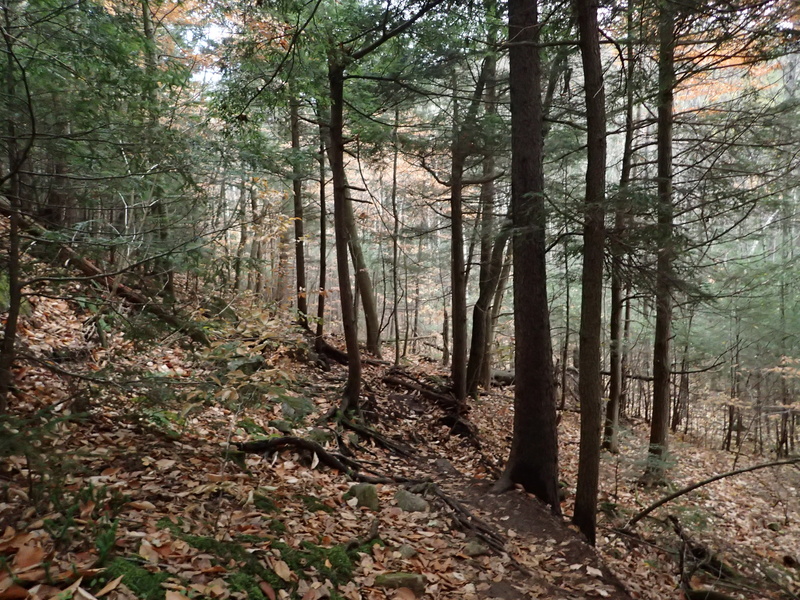 From the third junction it is 2.5 miles of steep hiking up to the summit. 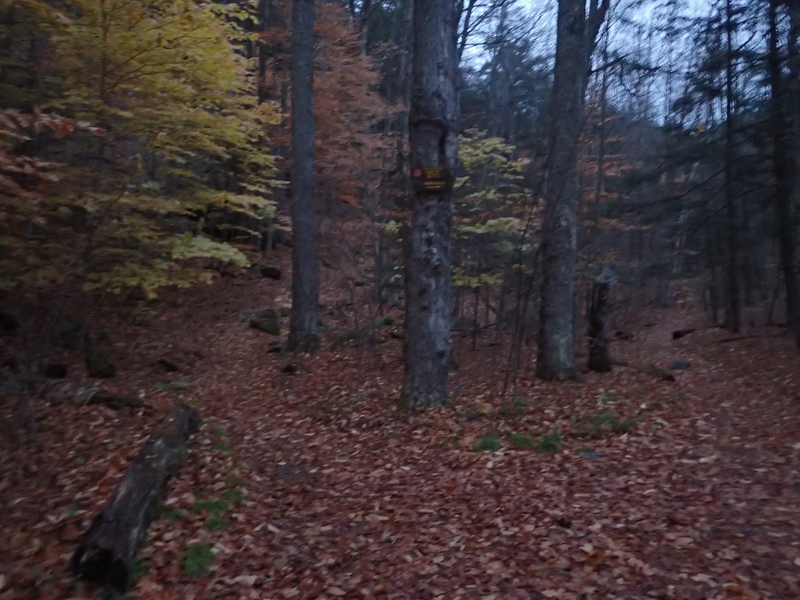 This junction is also the trail you would use to visit the Giant’s Washbowl. View of the third trail junction. From this junction the trail got rockier and steeper but we were still able to make pretty good progress. However, the weather did start to get worse as we started walking into the clouds and a hazy wet fog. The trail getting a bit more rugged as we made upward progress. About half way up this section of trail the fairly standard rocky trail began to give way to more substantial rock slabs to navigate. 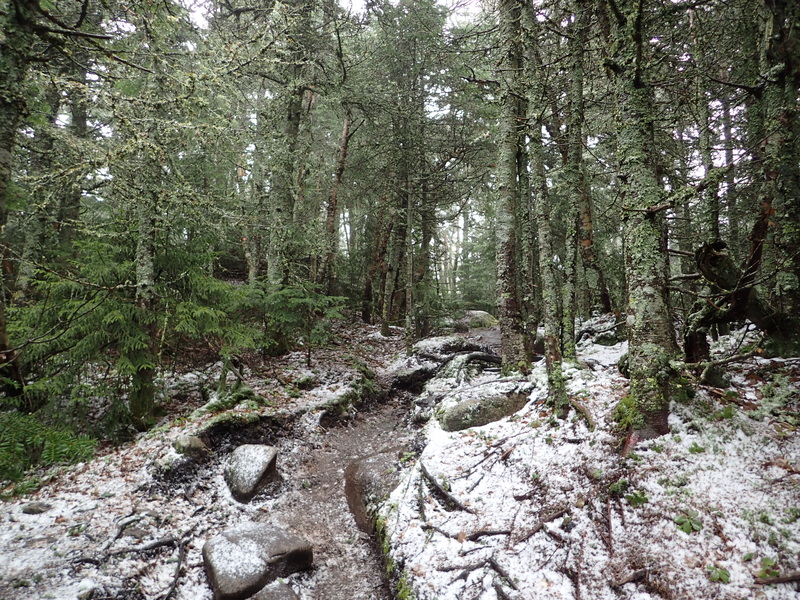 At this point on the hike we began to see the first signs of ice on the trail. 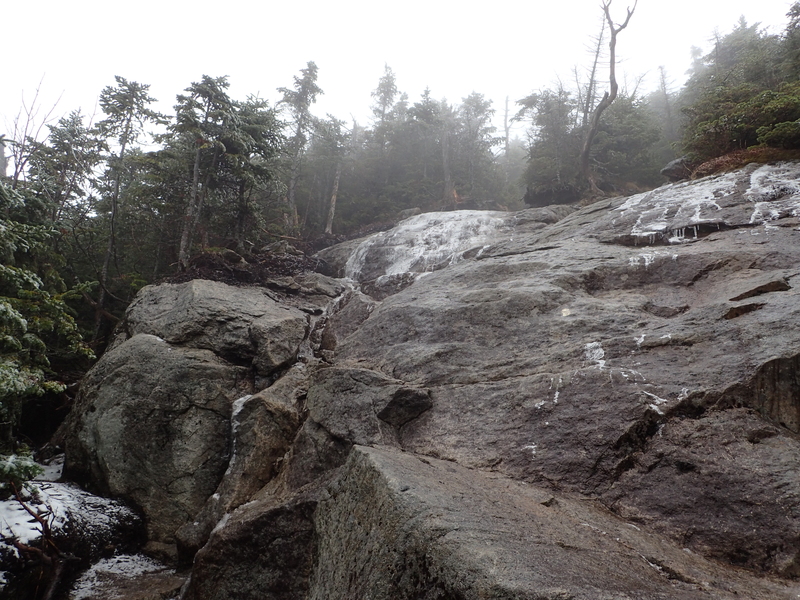 However, the ice wasn’t really substantial and could be easily avoided up to this point. The first major slab we reached also included a ladder over the steepest part making for a quick and safe ascent. 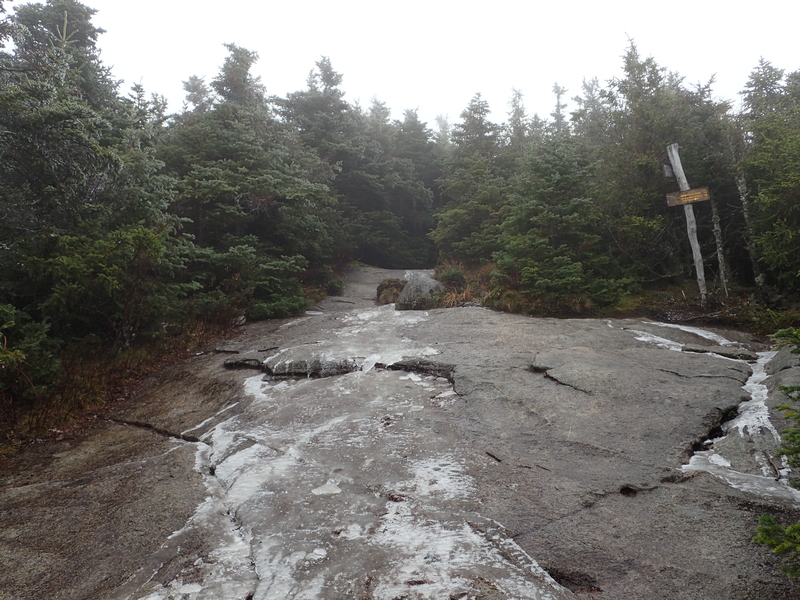 View of the first large rock slab and first signs of ice on the day. Ladder placed over the steepest section on the slab. 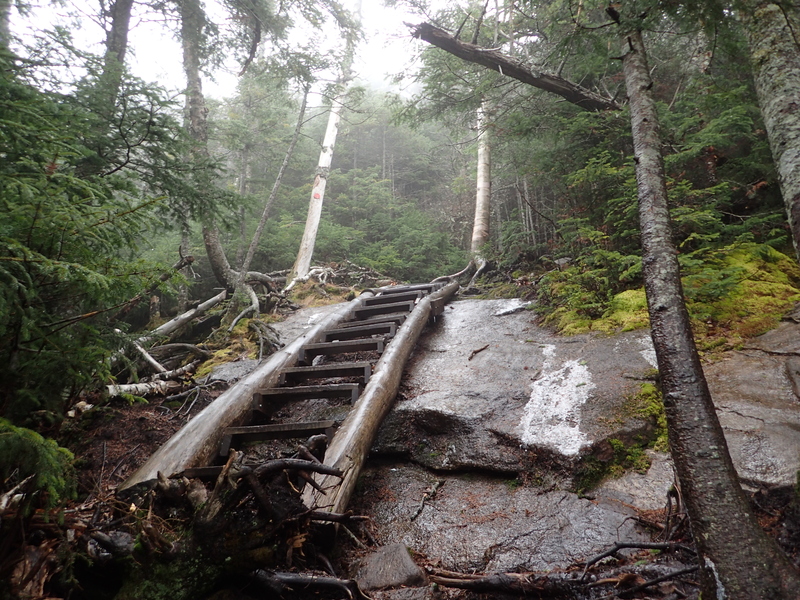 After getting past this obstacle we continued along the trail passing other smaller slabs as the trail got increasingly rugged. The weather also seemed to be getting worse and worse with every little bit of elevation gain. 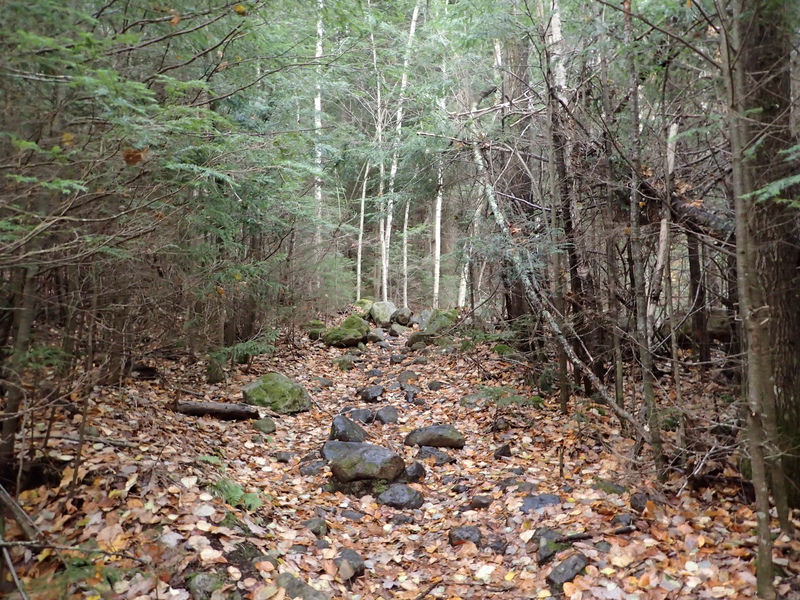 View of the trail up to the fourth junction. 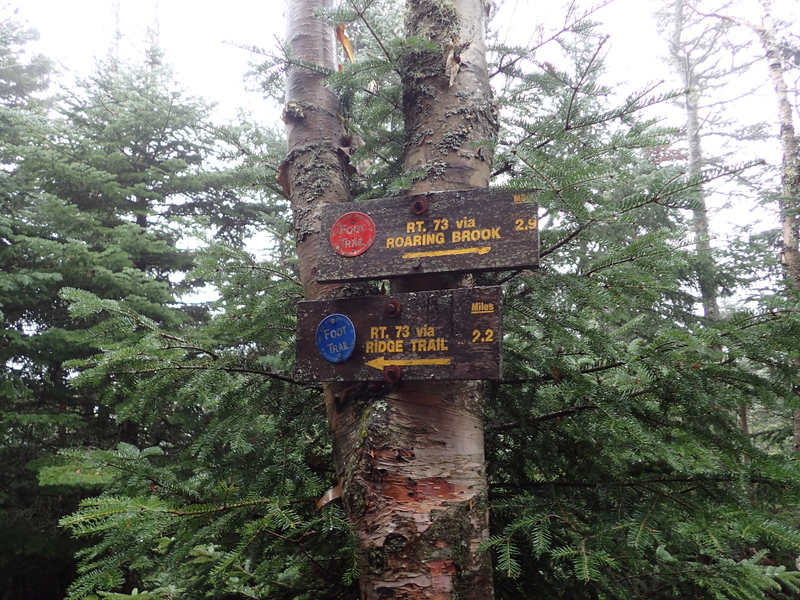 After passing this section we reached the fourth and last major trail junction on our ascent. From here there was only a short, but steep 0.7 mile section of trail to the summit. View of the fourth junction. 0.7 Miles to the summit from this point. Other mileage markers at the fourth trail junction. 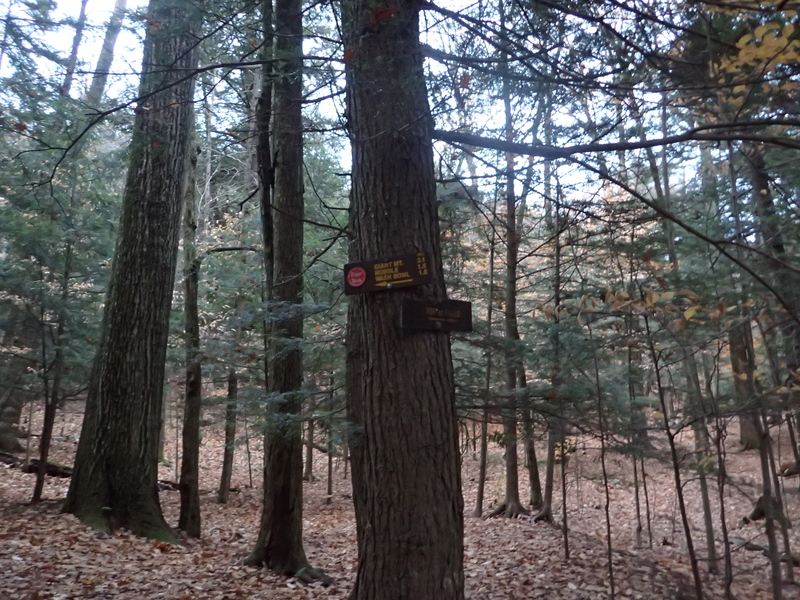 At this junction is also a sign marking the location of a newly installed privy off the side of the trail. We didn’t need to use it but it is positive to see this new addition to the trail. You should always be mindful of where you are doing your business in the mountains, and ensure you are following leave no trace principals. View of the trail following the fourth junction. 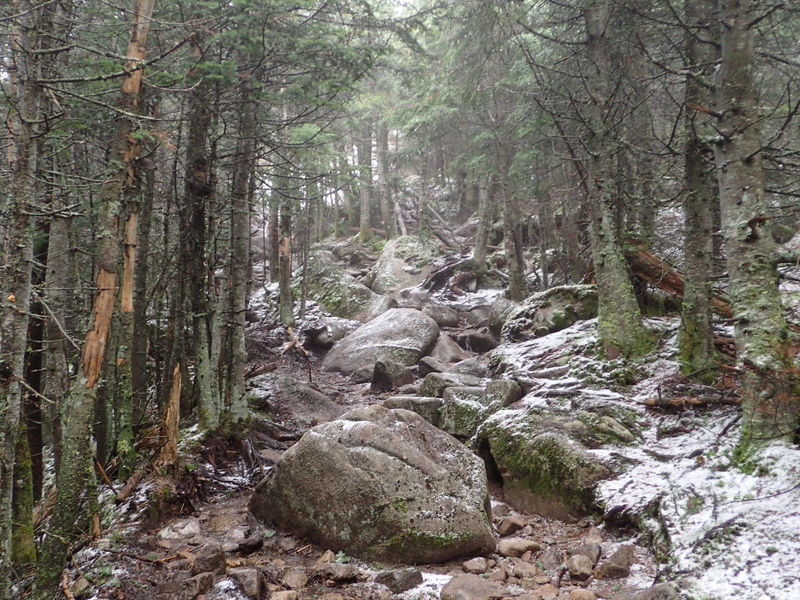 From this point the trail got much snowier and icier as we made our way upwards. It was certainly possible to complete the hike without microspikes but we opted to use them. It stinks to wear them out on bare rock but it helped make a few sections more secure. The microspikes are also great for speeding up overall travel time since you don’t need to contemplate each and every footfall. 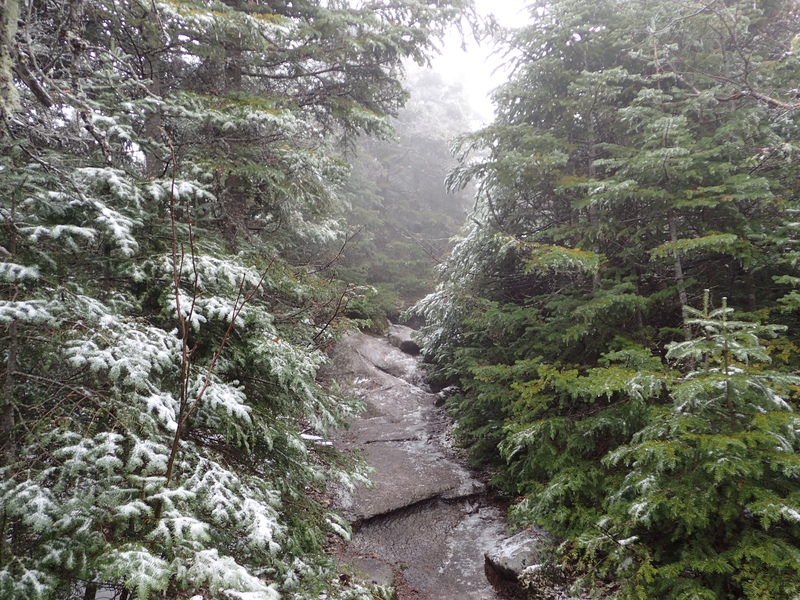 View of the increasingly snow as we approached the summit. Beautiful cold and foggy weather. 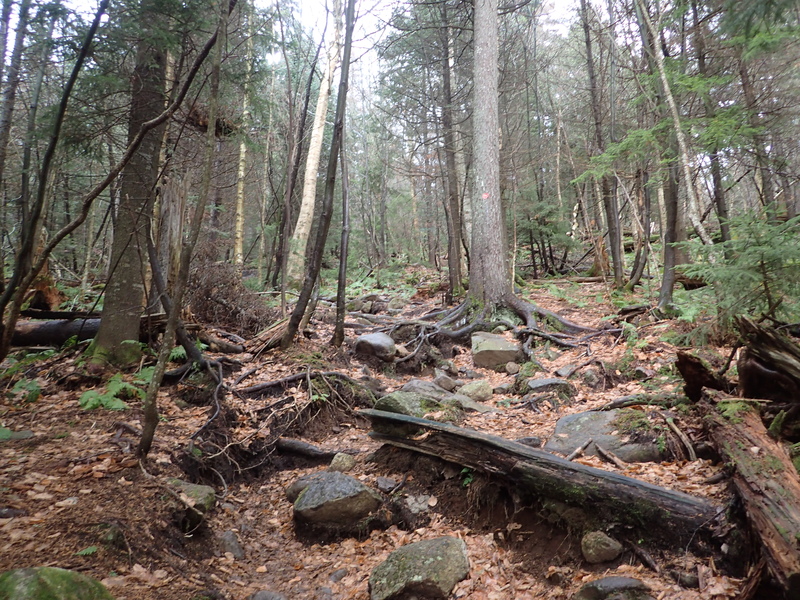 Along this last section of trail there were also a couple more significant slabs that need to be navigated. The first of which was much icier than the rest we had encountered up to this point. 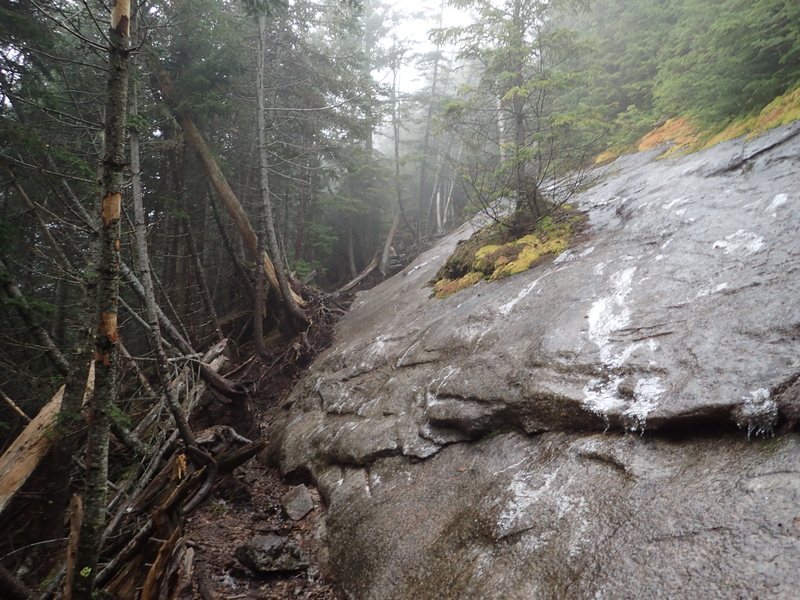 Before too long we reached the last major rock slab just below the junction with the summit trail. 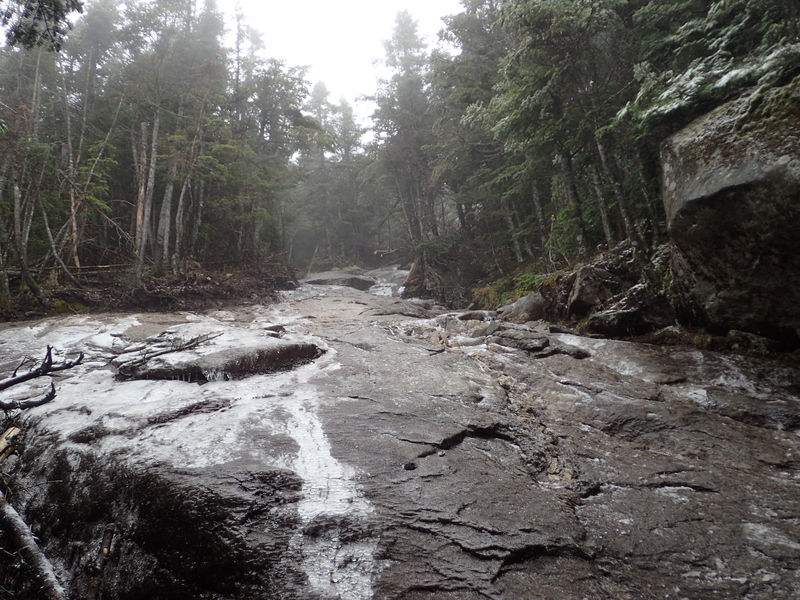 Here a couple of delicate steps are needed on icy rock to make your way up to the home streach. View of the last major hurdle before the summit. View of the final trail junction with the summit trail. After reaching the final junction we stayed to the left and walked the last few feet towards the true summit of Giant. The trail from this point is pretty simple and does not pose any particular challenges. 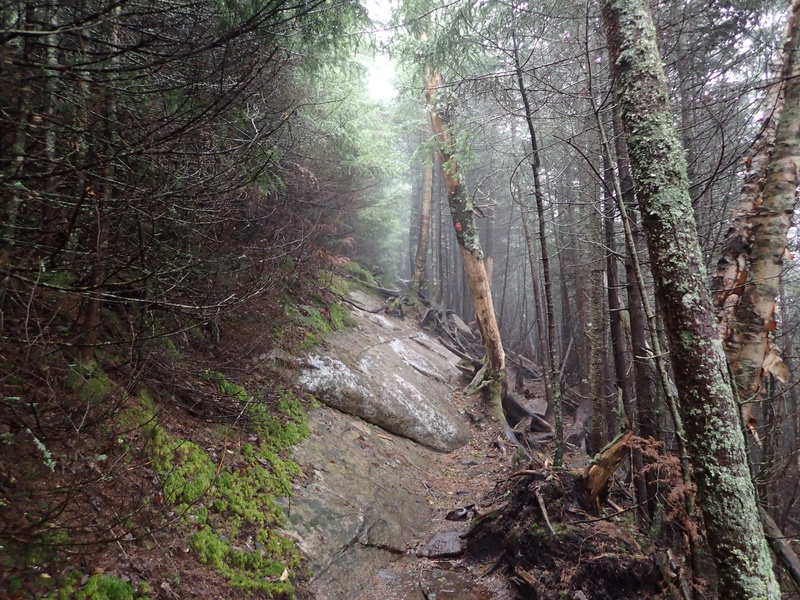 View of the trail to the summit. The summit itself consists of a large rock outcrop surrounded by trees. Normally you can still get stellar views from the open side of the rock but unfortunately on this particular day the views were not meant to be. Instead we spent our time on the summit soaking in the cold wind and not much else, but that is just how it goes sometimes. Beautiful views at the summit of Giant Mountain. 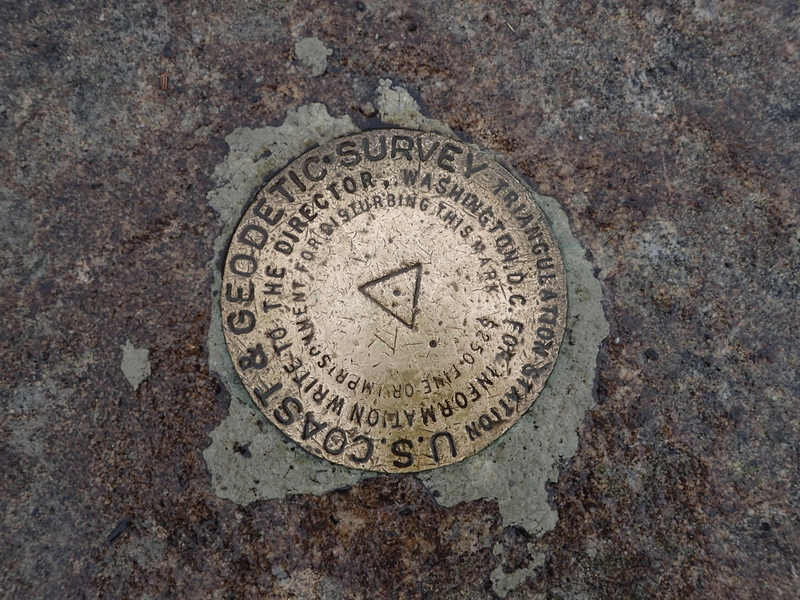 Benchmark on the summit of Giant Mountain. 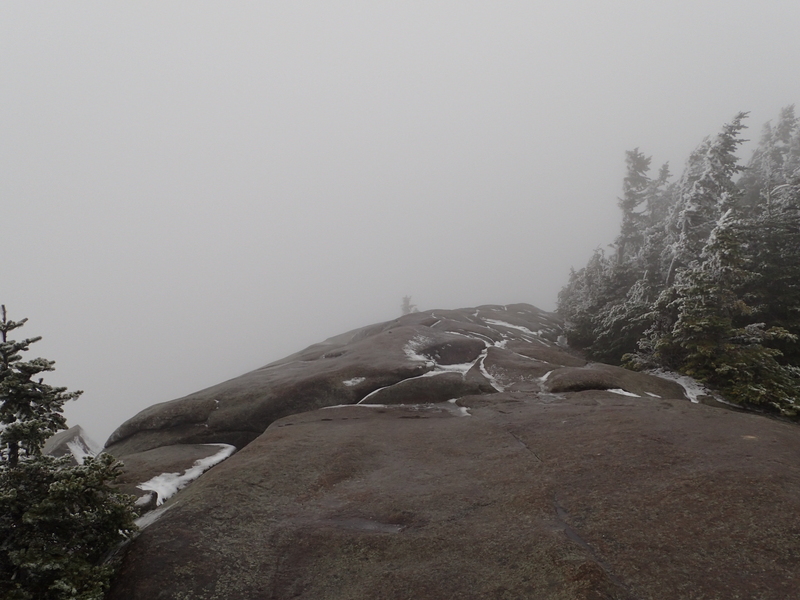 Since the weather was bad and we had no views, we did not linger long on the summit. We decided against doing Rocky Peak on account of the weather and lack of views so we just went back down the way we came up. The hike back was quick and we passed loads of other people just making their way up the mountain. By the time we made it most of the way down the mountain we passed back out of the clouds and got the first real view we had all day. It was mostly obstructed but it was still nice to see. First and only view we had all day. Despite the mostly crummy weather we still had a great day in the mountains. Ideally we would have liked to do Rocky Peak in the same day but sometimes you need to be willing to adjust your plans to the conditions. 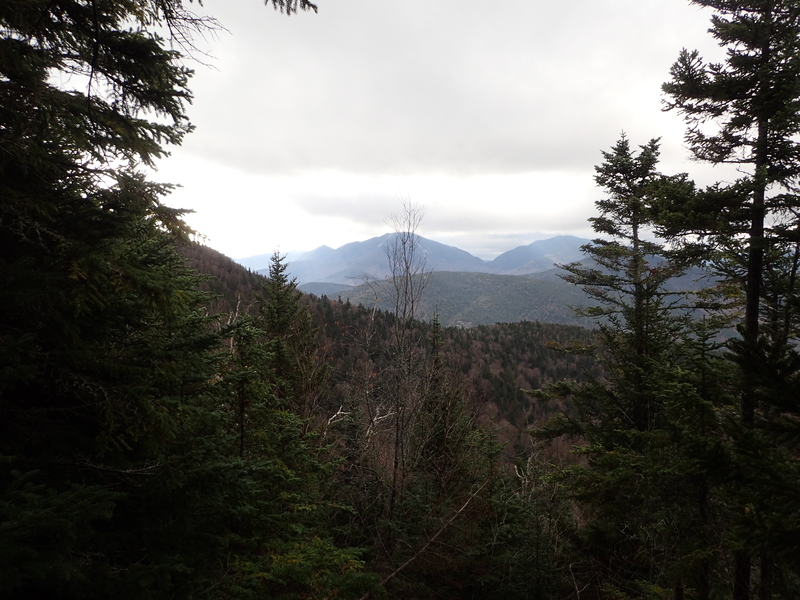 Any amount of hiking in the High Peaks Region is a great experience so it really wasn’t a big deal. All said and done the entire hike took us about 6 hours. Great pictures and excellent narrative blend. Feel like I did the hike! !